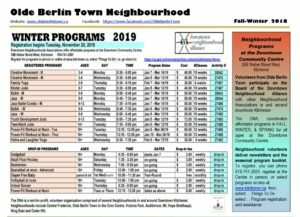 The Olde Berlin Town Neighbourhood Association is a non-profit organization founded to foster pride in our neighbourhood, promote community awareness and help ensure a safe neighbourhood by encouraging outreach and connection. 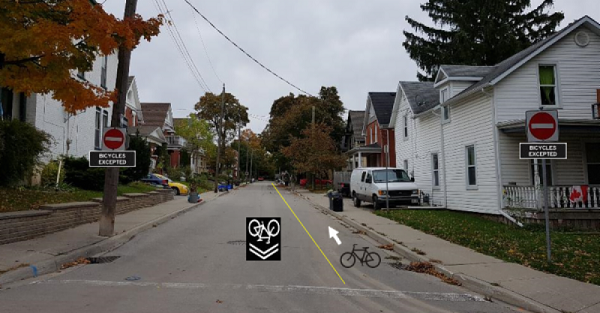 The purpose of this website and our social media presence is to provide information and an open forum for residents to voice opinions on neighbourhood concerns in a supportive and impartial manner. 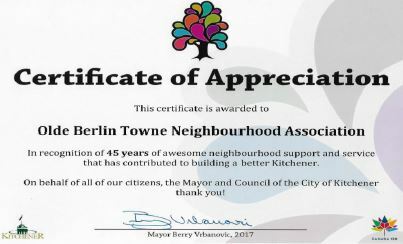 The neighbourhood association appreciates the support from the Downtown Neighbourhood Alliance, Downtown Community Centre, and City of Kitchener through #lovemyhood and other programs, and of course the people who live here and love the many features and amenities that make this a great place to live. Many thanks to the residents who volunteer their time to maintain the outreach to neighbours through Facebook, Twitter, the Newsletter (and delivering them! ), the (new) website, and participating in periodic Neighbourhood Association meetings at the Downtown Community Centre. Like all of us, your time is limited and we appreciate your invaluable contribution.